On Thursday 7 June 2018 at the Impact Hub in Lausanne, the Center for Philanthropy Studies of the University of Basel (CEPS) and Swiss Philanthropy Foundation are organising a breakfast meeting to discuss the evolution of philanthropy and its practices over the past 10 years. On June 1st 2018, the IU Lilly Family School of Philanthropy, will present the findings of the 2018 Global Philanthropy Environment Index in Berlin, Germany. Culture Matters: Connecting Citizens, Uniting Communities. On Thursday 31 May 2018, Swiss Philanthropy Foundation will discuss the issues of responsible investment for a foundation at the 9th Geneva Forum For Sustainable Investment (GFSI) edition in Geneva. Curious of what we did in 2017? The full Annual Report for 2017 is now available. Etienne Eichenberger, Chairman of Swiss Philanthropy Foundation, is sharing with us on one hand his insights on the state of philanthropy from not only a European, but also a global perspective. On the other hand, the Chairman addresses the priorities of Swiss Philanthropy Foundation for the next 12 months. 19 Countries · 334 European Non Profit Organisations · 5084 Donations · 6.38 M € --- Haven't you seen our video from the 2016 Annual Report yet? Check it out! 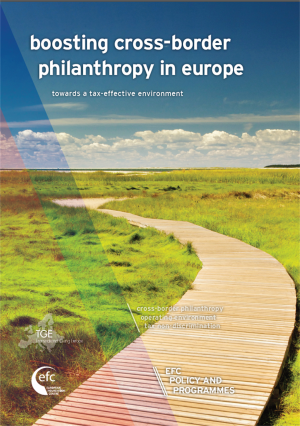 This publication offers recommendations and ideas which could potentially ease tax-effective cross-border philanthropy in Europe. Tax experts from across Europe contributed to this publication.